Allow me to preface this by saying I like the idea behind the Hyperdimension Neptunia games. And while I know it sounds like the kind of lame line someone throws out right before they’re going to break up with someone (enter the “It’s not you, it’s me!” quote), but I feel it’s fitting commentary given the developers involved in these games. Ideas are just that; it’s the execution that matters. Nowhere is that stigma more true than with games made by Idea Factory (or Compile Heart for that matter). They bring a lot of good and interesting ideas to the table that either take off significantly, or they crash and burn spectacularly. 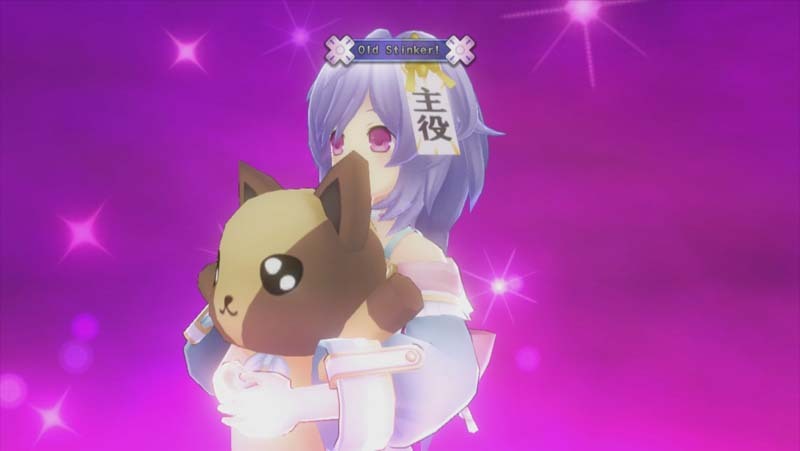 The original Hyperdimension Neptunia was an interesting starting point for the series. It introduced the concept of video game consoles and their respective affiliate companies being represented by an all female cast, while injecting a healthy dose of industry references and in-jokes. If you couldn’t get past the combat or the simple fact that you couldn’t even heal yourself when you wanted, it was a tough pill to swallow. I had a chance to go back and play Hyperdimension Neptunia mk2 following the preview I did for Victory so I could get a better grasp on its evolution. The game improved on a number of things that I had a gripe with in the original, though the game wasn’t nearly as humorous, nor was Nepgear a very strong main character (something that Victory makes a running joke out of). But still, I liked where things were heading, which would lead one to believe that the third entry, Hyperdimension Neptunia Victory, would completely knock it out of the park. Sadly, I can’t think of a clever quip that illustrates my position on whether that statement is actually true or not. It’s incredibly subjective, even as far as a review containing my own opinion is concerned. If I lost you there, let me back up a bit and tell you a little bit about the game. Hyperdimension Neptunia Victory is a direct follow-up to the events in mk2, though it does restore Neptune as the lead character. 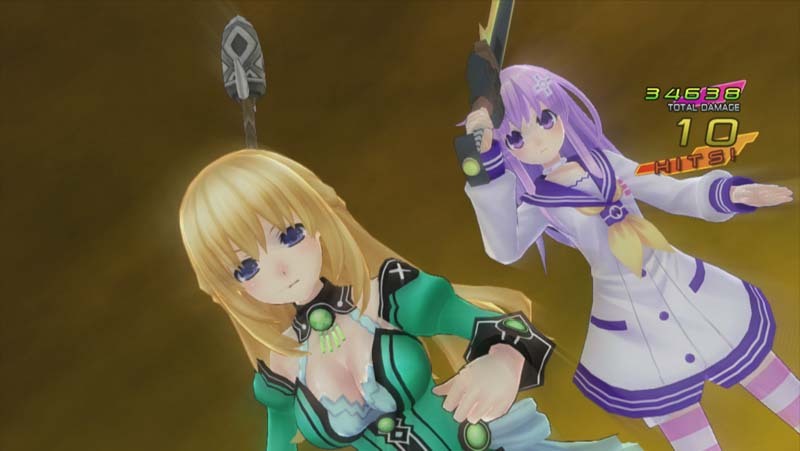 The land of Gameindustri is ruled by four CPU’s, which preside over countries that sound suspiciously like current gen consoles; Noire is the founder of Lastation, Blanc rules over Lowee, and Vert hails from Leanbox. Then, of course, there’s Planeptune which is representative of Sega. 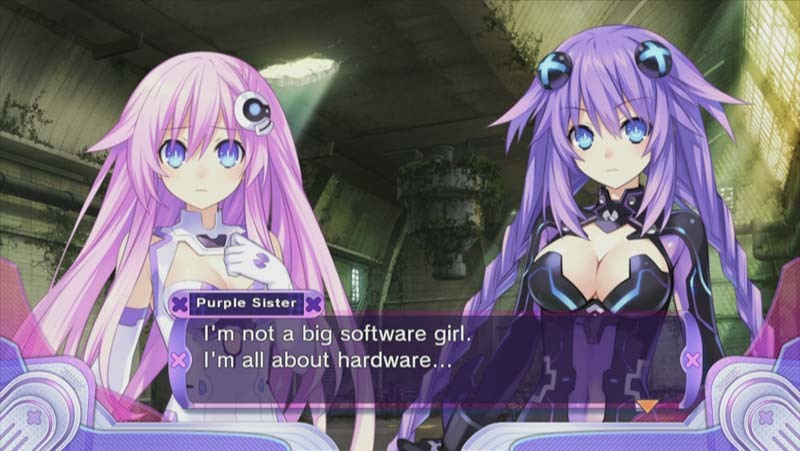 Each land’s CPU also have sisters that are representative of handheld consoles, such as Nepgear (Game Gear), Uni (PSP), and Rom and Ram (as a pair are the DS). 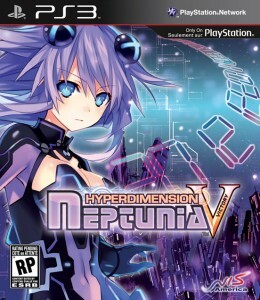 Rather than focus on uniting the nations in battling a common enemy, Victory has Neptune investigating a rebel group that believes that CPU’s should no longer exist and that the residents of Gameindustri can live without their guidance. During this investigation, one thing leads to another, and Neptune finds herself swallowed by a vortex that dumps her into an alternate universe; one where she is not the CPU of Planeptune and where Lastation and Leanbox have not been established yet. Instead, she discovers this dimension’s Planeptune CPU, Plutia, an airhead who gains her CPU abilities on accident while having a picnic. Despite her innocent and carefree appearance, her HDD form transforms her into a sadist who quite literally gets off on seeing others get hurt either physically or emotionally. As you might imagine, she transforms far more than her fellow protagonists care to endure, leading to some increasingly uncomfortable, yet humorous scenes of her â€œpunishingâ€ characters off-screen as well as other hijinks. The story is told in chapters, and is presented episodically in such a way as to mimic an anime with self-contained episodes (which I suppose is fitting considering there is an upcoming anime series based upon the games). Each one chronicles the struggles of Neptune and friends as they fight off a mysterious organization known as the Seven Sages and try to prevent their sabotage of the faith the citizens of their respective countries have in them. And despite being less cohesive in how its told compared to mk2, the plot is one of the main selling points of the game. It’s both better written and more humorous than the first two, while incorporating a ton of references and in-jokes that those who have followed the beginnings of all the major companies will get a kick out of. Nothing is off limits either, as such things as the Virtual Boy are mocked openly, with one character asking Blanc if she was â€œtrying to fail by designing itâ€ as well more recent events like the hacking of Sony during one of Noire’s open declarations of being number one in the market. It’s video game industry satire in the form of a video game, and it doesn’t get more poetic than that. 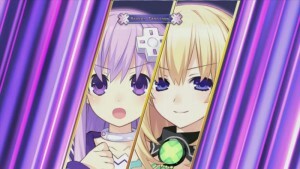 Hyperdimension Neptunia Victory shares its presentation style with the original, in that rather than using in-game models for cutscenes like mk2 did, it goes with still portraits that animate to a small degree. By small degree, I mean that aside from changing expressions as the scene dictates, they will occasionally “breathe”, which causes the bust on the bigger chested characters to bounce up and down. Speaking of big chested characters, whoever did the character designs did not hold back when coming up with some outrageous outfits for the CPU characters. Vert in particular is like Ivy from SoulCalibur while in her HDD form, in that with each iteration there is shrinking amount of material delegated to covering her breasts. It’s perfectly fine if you’re into that sort of thing, even better if you’re alone, but a random passerby might question what it is you’re really playing. There are some really cool outfits you can equip on the CPU characters though, particularly Blanc who can be decked out in gear that make her look like a Nintendo 64 or a Gamecube. A returning feature from the last game will allow you to upload your own picture in order to reskin the characters’ HDD forms. The models for both the playable characters and monsters are adequate, as they’re the same as what you’ve likely gotten used to in the last two games. 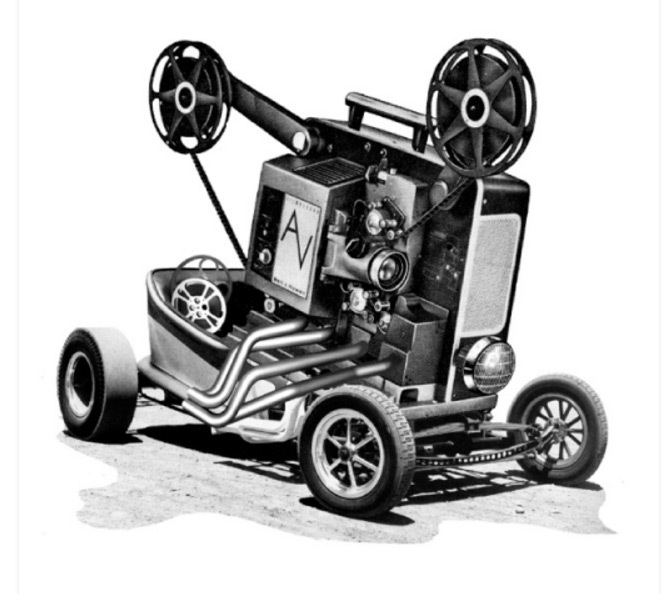 The engine seems better capable of keeping up with what’s going on, though there are still frame rate issues in places. The game also seems to have a case of Dragon Age II Syndrome, in that the same maps are recycled time and again, but with the exits moved around. 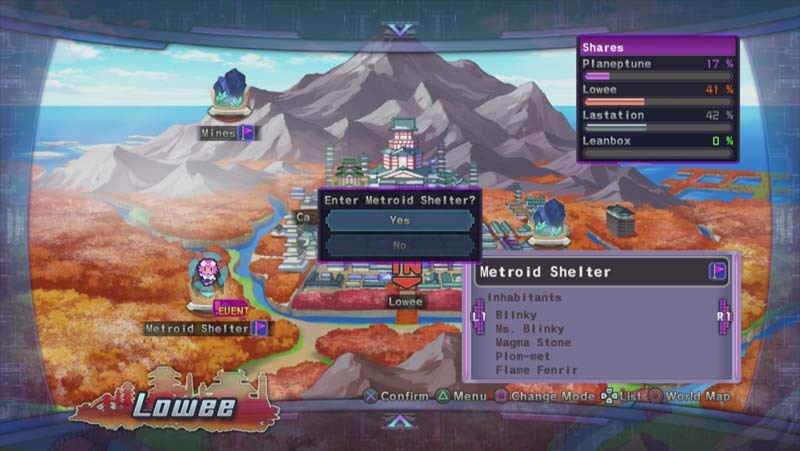 This gives less incentive to explore new areas that unlock as the game progresses, as they hardly feel new at all. The palette swapped enemies drive this home even further, though to be fair, the recycled enemy models are not a new thing in RPG’s and I quite enjoyed getting to fight Pac-Man ghosts and Space Invaders. The soundtrack is rather decent this time around, especially considering how often you’ll be hearing such things as the battle theme on account of all the fights (which I’ll get to in a minute). There are a few tracks recycled from previous games, but fortunately they are some of the better ones, so series veterans won’t mind at all. Victory also includes dual audio, and the English voice cast really does a good job with their respective characters. Not all scenes are voiced, though the major ones are, as well as all the battle quips. Their battle quotes, although humorous the first few times you hear them, will begin to grate on your nerves when they repeat the same several lines over and over and over again. 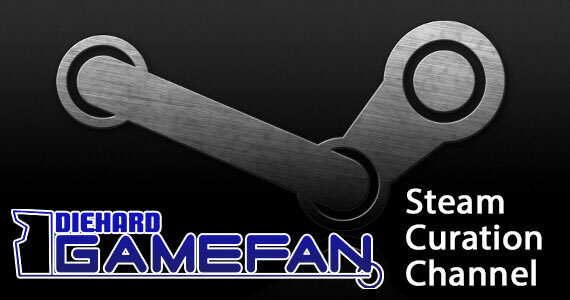 Bless her heart, but there is only so many times I can stand to hear Neptune exclaim “IT SHOULD ALWAYS BE MY TURN… but games don’t work like that, huh?” before I want to scream. Some of her exclamations upon level-up are really amusing though, particularly when she hums the Final Fantasy fanfare. 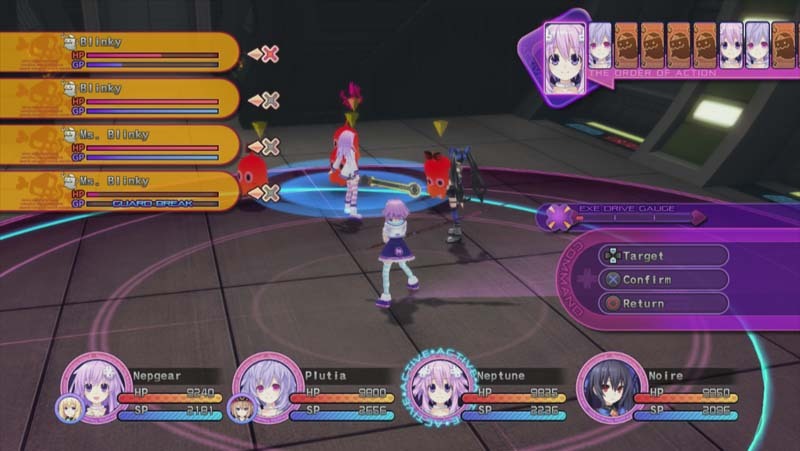 If you’ve played the previous game in the series, you should have a pretty good idea of what you’re in for in Hyperdimension Neptunia Victory, though if you passed over it after playing the first, let me tell you that the combat is a huge departure from the original. When you’re out exploring a dungeon (or retreading a familiar dungeon layout as the case may be), enemies are visible to you and can be either approached or avoided. You can swing your weapon with X to get an advantage in the battle and move the turns of all of your characters up to the front, as well as instantly destroy them if you’re strong enough. Likewise, if an enemy spots you and hits you first, they’ll gain the first move. Once in combat, despite being a turn-based RPG, your movement and positioning plays a huge role. 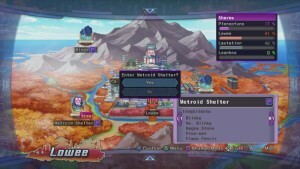 During a turn, your character has a large circle surrounding them indicating where they can move about the map, as well as a hit box in front of them that demonstrates their attack range. The nice thing about this setup, is if you manage to get the enemies to bunch up, you can strike the entire party at one time if you want to and potentially decimate them with a single combo. Victory comes with a set of improvements in the combat, as the developers managed to simplify the interface without sacrificing the number of strategic options at your disposal. If you decide to engage an enemy, there are three kinds of attacks that can be strung together into a combo. Triangle is a rush attack that gets you more hits, square is a power attack for going all out, and X is for break attacks that are better at reducing an enemy’s guard. If you build up an EXE drive gauge enough, you can finish the combo with one of a number of attacks depending on how many bars of the EXE meter you have filled. Unlike mk2, your attacks don’t miss every other swing in Victory, so combat feels not only more satisfying, but moves at a quicker pace. You also start battles much closer to your enemies so you don’t have to spend a turn moving at the beginning. You can even customize your combos by building the most powerful ones in your arsenal, without worrying about combat efficiency, as SP acts more like the MP meter in most other RPG’s. And like those games, you don’t have to pass your turn to build it up. 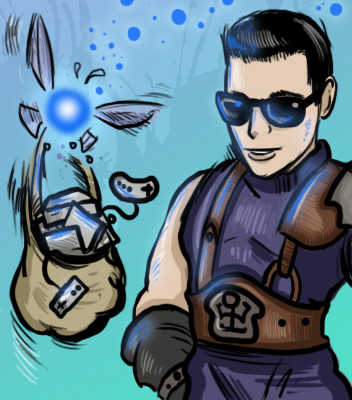 In fact, they are spent on SP skills such as healing, buffing, or launching devastating attacks, including summoning a ship with Keiji Inafune’s face on it and hurling it towards the enemy. Yes, that is a thing that happens. CPU characters can transform at will into HDD form at the expense of your SP, though unlike mk2, it doesn’t wear off after awhile. You will stay in HDD form until you change back or are knocked out (which will happen more than you think), which is a nice change of pace. You can also tag team characters that are in the back row to fill in for the four that you can have in the front lines, though having certain characters paired up will offer statistical benefits and potentially bonus XP if their affinity is high. When your characters reach a certain level, they can exchange part of the EXE gauge to perform truly devastating attacks, some with the help of fellow comrades so long as they are in the same form. There is more to exploring dungeons than just combat. Your lead character can now jump, which in of itself isn’t particularly useful, but it will help you clear a few ledges that you wouldn’t be able to walk over normally. Using the square button will send out a pulse that will reveal any hidden items nearby. There aren’t any clues so far as I can tell as to where these items are, you just have to send out the pulse randomly and hope you find something. The items you find do end up being worthwhile most of the time. Bonuses are awarded as well based upon such things as how often your lead character jumps, how much damage your characters soak up, and how many items were picked up that will grant permanent stat boosts. While there are towns to visit, they can’t be explored in the traditional sense. Much like the overworld, navigating towns is a matter of maneuvering a cursor over what it is you want to interact with and then doing so. Each nation you visit will bring about familiar faces, such as characters that appear strikingly similar to Mario and Solid Snake. You can visit Neptune’s room or a hotel if you’re visiting another nation that will allow you to watch unlocked cutscenes or indulge in any of the photos and sounds that you’ve unlocked. There’s also a TV that will occasionally display programs, such as a home shopping network or a quiz show to gain items. A meta game of sorts can be accessed from here too, which involves sending recruitable characters out to unlocked dungeons to hunt for items for you. Upon their return, they may bring back something, or they may change the monster spawns and rate of experience for that particular area if you choose to believe they are being honest with you. Their success will earn them levels, which in turn will increase their success even more. It can be an interesting diversion, but you will often forget to check up on them when they return. Items can also be synthesized using parts found from defeated monsters or quests. When you synthesize an item, you not only get it added to your inventory, but it will also become available to purchase should you want more. This is particularly helpful with healing items and accessories that you might want to equip on multiple characters. Shops will get regular inventory on their own regardless, but you can generally synthesize better things than what you can buy. One nice thing in Hyperdimension Neptunia Victory is that you always know what your main quest goal is, as the person or area that needs to be interacted with is always marked with an exclamation mark. On the other hand, if you don’t see one, this means you have to head to the guild and fulfill a mission that has the name in brackets. This wouldn’t be such a big deal, but these required guild missions don’t differ much from the run of the mill optional quests that you pick up. As a result, you’ll be expected to perform some very arbitrary tasks, such as collecting a certain amount of an item, or defeating a predetermined quantity of a particular monster. Sometimes you might get lucky and already have the items in your inventory when you take on the quest, but honestly, this seems like needless padding to extend the game length. And it’s not the only thing in the game guilty of contributing to that. You see, for all the things that Victory gets right, it does one serious thing wrong. The game is horribly imbalanced. This is coming from someone who managed to roll the credits in Dark Souls, a game that prides itself in some often cheap deaths. And the thing is, I don’t understand why it had to be this way. Hyperdimension Neptunia mk2 managed to get things right for the most part, but Victory will throw complete fodder for enemies at you for long periods of time and then match you with a boss that will just annihilate you. Sometimes, even regular enemies who aren’t all that difficult will sometimes catch a virus that will transform them into a more powerful version of themselves and lay waste to your entire party before you can even get a turn. This is rather ridiculous, especially since 95% of the time, an attempt to run from incredibly strong enemies will lead to failure and you can kiss the last half hour of progress goodbye. To be clear, I have no problem with challenging boss fights. In fact, I welcome them if there is actually some strategy involved. But nearly every boss in the latter part of the game can kill a party member in one blow if you’re not prepared, even after equipping powerful HP boosting items. The strategy for bringing them down is always the same too. Once the boss focuses on one of your party members (in my case, it was always consistently Neptune), one party member will revive them from the insta-kill so they can soak the damage again next round, while the other two crush their guard and proceed to deal as much damage as possible before the boss can regenerate it all back. Some battles can last an excess of thirty minutes just on account of how much health gets regenerated by the boss. And the only way to mitigate that (or survive for that matter) is to grind for hours prior to the battle. Fortunately, you can eventually unlock a colosseum to make this a bit easier on you, but at what point do you realize that if you are going to spend most of your time playing the game while simultaneously watching Netflix, that it would be wiser to just do the Netflix part? Now don’t get me wrong, I had a blast with the battle system and they managed to pack a ton of content into the game, including sidequests in the form of guild missions and entire areas that can be optionally explored (with more DLC on the way). And many of the missions can be completed simultaneously since much of them take place in the same areas. They can be done while on your way to do the story missions if you really want to, and are repeatable. But having these guild missions force fed to you as a way to progress the plot is an annoyance, as is spending hours building levels between boss battles. You also have to participate in them to build shares for your nation, which can influence the ending. Victory had an opportunity to break out of niche status with this entry. Instead, for every little thing they managed to improve upon, something else gets goofed up along the way. Still, if you liked the previous games, particularly mk2, I have no doubt you are going to like Hyperdimension Neptunia Victory. For everyone else, I recommend trying it first, if for no other reason than to experience just how off the wall and humorous it is. Unless you already know that you’d be perfectly okay with traversing identical looking maps while grinding for hours in order to prep for boss fights, in which case, just go buy it. The best way to describe Hyperdimension Neptunia Victory is by using the very metaphor that the game itself hinges its entire plot on. Imagine the game itself is a girl. Her humorous storyline and fun combat system draw you in at the beginning, and your relationship builds up pretty fast. However, once you begin to notice the recycled dungeons and woefully unbalanced foes that require you to commit hours of your time to grinding, you begin to realize how very give and take of an experience it is. And that’s really the key here: you’re only going to get out of the game as much as you’re willing to put in. If you’re not willing to dedicate at least 50 or 60 hours to experiencing the full benefits package, you might want to consider getting engaged to Hyperdimension Neptunia mk2 instead, despite the plot inferiority. On the other hand, if you’ve been committed to the series this far, you’re in for one hell of a honeymoon.